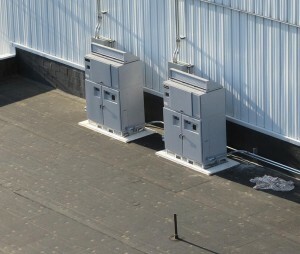 If the structural engineer determines the building can handle the load, the next thing to consider is how you will mount the inverter on the roof. One option is to cut out a section of roof membrane and insulation and install a flashed curb that is bolted directly to the roof deck below. Effective, but involves cutting a hole in the roof, which we always try to avoid. Pure Power has a better solution that is more cost effective, easier to install, and that doesn't involve cutting a hole in the roof. You can place the inverter directly on the roof surface, using an outrigger pad to evenly distribute the weight across the roof membrane and insulation. Polyisocyanurate insulation is has a compressive strength of least 20 PSI, which converts to 2,880 PSF. 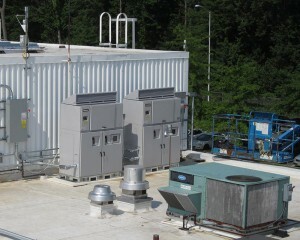 A 100kW inverter weighs around 3,000 across a footprint of 15 square feet, which translates to an average load of 200 PSF, less than one tenth the compression strength of the roof insulation. In the past, we have used 2” thick white outrigger pads (used to distribute the weight of crane outriggers) with a slip sheet which look great! One tip, locate near a wall so you can provide a lateral support to address the concern of tipping over during a hurricane.